Email overload is the bane of knowledge workers’ existence everywhere, as well as the impetus for numerous startups trying to perfect alternate collaboration platforms. But exactly how much inbox junk do we waste our time processing? Two new studies on the quality of work emails are in, and the results are pretty grim. What are the headline takeaways from the research? The first study, from email security and archiving firm Mimecast, found that just one in four work emails is essential and just one in three holds immediate value. The second study combed through the inboxes of disgraced Enron and revealed what emails do contain if not critical business information. The answer? Gossip. Of the 112 emails the average corporate email user sends every day a substantial 15 percent contain gossip, the research concludes. The Mimecast results were drawn from 500 interviews with IT professionals, 200 in the U.S., 200 in the U.K. and 100 from South Africa. What other details of the corporate email inbox did the study’s less than flattering portrait reveal? For the second study, assistant professor Eric Gilbert of the School of Interactive Computing at Georgia Tech examined hundreds of thousands of emails from Enron, hunting for gossipy missives. “Gossip” in this case being defined as emails that talked about a third party that was neither among the recipients nor the sender of the email. Exactly 14.7 of emails were revealed to contain gossip, with all levels of the corporate hierarchy engaging in gossip, though lower levels were more prone to swapping juicy morsels. And Enron’s email gossip wasn’t overwhelmingly things like complimentary comments about the new hairstyle sported by the colleague in the next cube over. Negative gossip was 2.7 times more common that positive gossip. But despair not. Gilbert says gossip has its upsides. “Gossip gets a bad rap. When you say ‘gossip,’ most people immediately have a negative interpretation, but it’s actually a very important form of communication. Even tiny bits of information, like ‘Eric said he’d be late for this meeting,’ add up; after just a few of those messages, you start to get an impression that Eric is a late person. Gossip is generally how we know what we know about each other, and for this study we viewed it simply as a means to share social information,” he says. Why do knowledge workers continue to rely so heavily on email even though there’s mounting evidence that it’s a form of communication with big downsides? Image courtesy of Flickr user Lars Plougmann. Ramon and N, I think you’re wrong – in more ways. External services like Twitter and Yammer will not replace email in a business context. Integrated solutions are replacing email already, though. We use activity streams in our intranet as a means of communications. It works, everything is kept where it belongs – in a business context, related to what you’re talking about. Which points to your argument, N. Having everything in one place. With emails, you don’t. Instead you have tonnes of fragmented communication available to you only. Share the information, but please don’t cc me. Here’s how we do it – sorry ’bout the link, but it explains it nicely. Why do people continue to rely heavily on e-mail? Because it’s a tool that works no matter if you’re using Gmail, Yahoo! mail, corporate mail, or whatever other e-mail system. It works for internal AND external collaborators. You don’t have to worry about whether everybody is on the same platform (FB, Twitter, etc.) and whether they use it for work. I haven’t seen another tool come along that can address that issue. If you’re one of the lucky ones who only work w/ people who also uses the same alternative tools that you do, then sure, you can use FB or Twitter or some combo of Google products. But most people don’t have that luxury. Also, while the story cites statistics about the inefficiency of e-mail, it would help put those numbers in perspective if we had stats on the efficiency of the alternatives. Email has been around for a long time and serves its purpose well. Policies and better practice amongst users will vastly reduce the overload and negative connotations associated with email. Journalists love to bash email but they don’t work in typical corporate environments and fail to understand its chief benefit — having everything you need in one place. This key feature is why nothing has or can replace it. By blaming email, the communication tool, for problems like this is missing the whole point. The problems occur because of the way we communicate, and would manifest in similar forms in any system that we replace email with. Consider using our tool – http://grexit.com – it helps you share useful email conversations by sending them to a shared, centralized repository, thereby helping you reduce clutter in email inboxes heavily. It also give you shared labels for google apps email – it can go a long way in helping you communicate better, leaner, and collaborate easily from your email inboxes. I think much of the reason many still use email is part nurture and nature. Email has been the primary means of communication for over a decade. And as cumbersome it can become at times it is still a fully functional messaging platform. 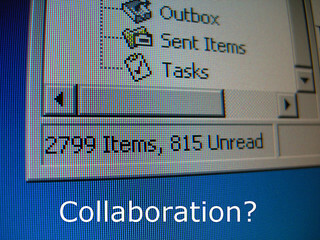 Can services like Twitter or Yammer replace email? Not yet. Why do knowledge workers continue to rely so heavily on email even though thereâ€™s mounting evidence that itâ€™s a form of communication with big downsides?